Is This Me? : How You Doin'? My name is Denver Lancaster. I am a Doctor of Physical Therapy graduated from Regis University working for Gottsche Rehab in Cody, WY. This is my first race since my triathlon. 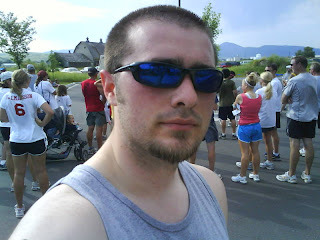 It's only a 5k run but it was a good one for me. 32 minutes(10 minutes faster than last time!) with an average heart rate of 170 and 180 max. Knee pain was manageable. July 13th - Bring on the next Tri!! up for the inaugural race. percentile was 88. Your time of 32:19.1 gave you a 10:25 pace per mile. This topic have a tendency to become boring but with your creativeness its great. 2nd of july fireworks over coors field sunset for your viewing pleasure. Removing the Northstar Engine on a 97 Cadillac Deville Concours. To CRUSH your enemies! To see them driven before you!